...overjoyed at the fact that I am now in my twelfth year of remission, have a gorgeous wife and two perfect children, and have the job that I'd always dreamed of. Won the Traxxas Nitro Shootout for the third time in six years with a final-round decision over Robert Hight at the Chevrolet Performance U.S. Nationals. June 25, round one, marked career 350th round win. FC event winner at Norwalk. Went on to win that event marking the 25th career win. Tied a new track record at Englishtown with a 3.867-second pass and won the event. Halloween weekend wasn't scary at all. Las Vegas, October 27, set track record and ended the day in the #1 qualifier position. Set career best speed at Las Vegas 2. Had two runner-up finishes and two No. 1 qualifiers. November 12, 2016, closed qualifying with a track-record time of 3.825 secondsto secure the team's sixth No. 1 qualifying position of the season. In all, the team set four time and seven speed records in 24 Mello Yello events. November 15, 2015, 4th time in a single season resetting the national ET; 3.884 seconds. October 4, 2015, after a soggy Friday with no qualifying and only one qualifying run on Saturday, Jack went on to break another National Recordon Sunday in the third round of eliminations with a new personal best 3.897 ET at 326.87 mph. This run was backed up by his first round ET of 3.925 seconds. August 8, 2015, obliterating all previous track records, Jack again made history with yet another record breaking run. He remains the quickest Funny car in NHRA history and has broken his own record set just one week ago. During qualifying for the NHRA Pacific NW Nationals he recorded the quickest run ever at 3.912 seconds. July 31, 2015, Jack once again makes history by powering to the quickest Funny car run in NHRA history during qualifying for the NHRA Sonoma Nationals. He finished with a record time of 3.921 seconds at 323.43 mph. He certified the run as a national record when he backed up the national E.T. record with an incredible 3.958 second run during Q4 on August 1, 2015. The 2012 world champion made NHRA history on May 24, 2015 by becoming the first driver in a Funny Car to record four consecutive runs below 4 seconds when he dipped into the 3-second range in the last two of three qualifying sessions then started championship eliminations in the 3s for the first two rounds.That win marked the 250th NHRA national event title for Don Schumacher Racing. In just 4.5 years the Infinite Hero Foundation race team has raised more than $500,000 for the IHF to help injured veterans facing physical and mental challenges related to their service. This is possible because the entire operation is funded by Doug Chandler and late Terry Chandler. Serves as a consultant at Frank Hawley's Drag Racing School and has taught more than 7,000 students since 1998. 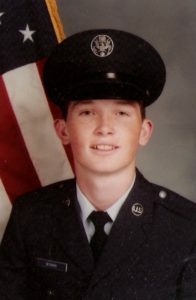 Former sergeant in U.S. Air Force. The City of Norco, Calif. presented him with a ‘Key to the City’ on Aug. 10, 2013 and declared the day ‘Fast Jack Beckman Day’. On May 2, 2013 was presented with the U.S. Air Force Wall of Achievers honor in Enlisted Heritage Hall at Gunter Annex of Maxwell AFB in Montgomery, Ala.
Has been licensed in 12 different NHRA competition categories. The two that stepped up to benefit a tremendous cause and put Infinite Hero Foundation on the sides of my racecar! Jack and Jenna, drag racers mind, body and soul, were married at the NHRA Museum in Pomona, California. 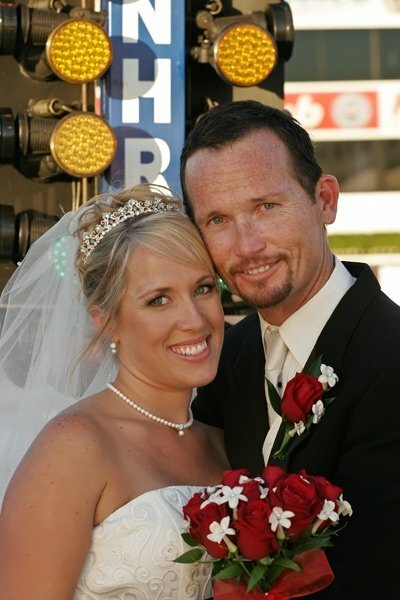 This wedding photo was taken at the starting line of the Pomona race track. Jack Beckman, the 50-year-old driver of Terry Chandler’s Infinite Hero Dodge Charger R/T Funny Car for Don Schumacher Racing, began to pursue his drag racing passion in 1998 when he became a driving instructor for Frank Hawley’s NHRA Drag Racing School and went on to help more than 7,000 students earn their NHRA competition racing licenses. He made his debut as a part-time Top Fuel dragster driver in 2005 after a winning battle against non-Hodgkin’s Lymphoma. The California native who lives in Norco, Calif., with his wife Jenna and two children, joined DSR in 2006 and won the 2012 NHRA Funny Car world championship, nine years after he became the Super Comp world champion in NHRA Sportsman competition. Beyond the hard work produced by his team, Jack can be proud of two special campaigns he spearheaded at NHRA events. As a cancer survivor, Jack has served as a national spokesman for Amgen's Chemotherapy: Myths or Facts campaign to help others suffering from cancer and their families. In 2014, Jack began educating race fans about the Infinite Hero Foundation, that confronts mental and physical issues facing returning military heroes and their families. Through sponsorship from Rodger and Karen Comstock’s Mail Terminal Services, Jack’s Dodge Charger R/T carried the message of Wounded Warriors and encouraged NHRA fans to complete a special postcard provided by MTS to send a special message to a soldier injured in Afghanistan or Iraq. “Both of these programs are very special to me as a cancer survivor and former U.S. Air Force Airman,” said Jack, who made the transition from a self-proclaimed high school dropout to an honorably discharged sergeant four years later at age 21. His passion for drag racing was so strong that he left a secure job of 10 years as an elevator technician in 1998 to become an instructor with Frank Hawley’s Drag Racing School at Pomona, Calif. Through his involvement with the school, he met his wife, Jenna, and the Comstocks, who in 2005 helped fulfill his dream to race professionally the year after he successfully completed treatment for non-Hodgkin’s Lymphoma. Jack was optimistic about the 2012 season after crew chief Rahn Tobler and crew led him to a second-place finish in the 2011 NHRA championship standings with three event titles and one No. 1 qualifying position. After the fourth event of the 2012 Mello Yello Drag season, Jack and his Valvoline/Schumacher Electric team were ranked third in points but at the end of that race team owner Don Schumacher opted to move Tobler and Jack’s crew, to teammate Capps after the NAPA Funny Car didn’t qualify for that event at Las Vegas. The following week, Jack had a new crew chief. At the next event, the team lost in the second round of eliminations and the following event failed to quality. The third time out, Jack lost in the first round near Atlanta and dropped to sixth in points. But two weeks later near Topeka, Kan., the “new” team won their first NHRA national event title together and the march to the championship began. 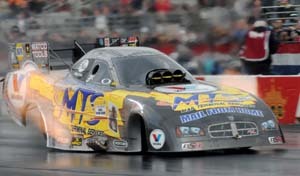 Over the last 16 NHRA events of 2012, Jack won three race titles and qualified No. 1 four times. And no event was bigger for the team than the one on Oct. 5-8 at Maple Grove Raceway near Reading, Pa., where the team set NHRA national records for elapsed time (3.986 seconds) and speed (320.58 mph) and advanced to the semifinals. The E.T. record earned a 20-point bonus that was pivotal in his championship race with Capps. In the season-finale at Pomona, Jack had to keep pace with Capps and when the NAPA car lost in the semifinal round the championship went to Jack and his team by two points, in the closest finish in funny car history. Like many successful race car drivers, Jack inherited the racing gene. Jack’s father, Bob, and mother, JoAnne, were “car people” who introduced him to the mechanical aspects of street cars. By the time Jack was 17, he had owned several cars that contributed to honing his mechanical skills. Jack notes that it was his Uncle John Jorgenson who convinced his parents to let him take Jack, who was 7, and his brother to Orange County International Raceway for their first drag race. His father – who goes by “Slow Bob” to contrast his son’s moniker of “Fast Jack” – was a hot-rodder. Bob didn’t race but passed on mechanical skills and sold his son a 1968 El Camino that he still owns. Once Jack passed his driving test in the El Camino on his 16th birthday, he started tinkering with its intake manifold, camshaft and other components. He was honorably discharged as a sergeant at age 21. Soon after returning home to Southern California, he joined the Funny Car team owned by Tim Grose where he worked on the bottom of the engine at races. But after the team lost sponsorship funding, Jack took a job in 1988 as an elevator technician for Westinghouse in Southern California. During that part of his life he began competing regularly in NHRA Sportsman categories. Drag racing remained his passion and doing it full time was a dream. He quit the elevator company after 10 years to become an instructor at the Frank Hawley Drag Racing School. Among the 7,000 or more students he taught – including several of whom he has raced including John Force’s daughters – were some who continue to play major roles in his life. In 2003, Jack drove his 160-mph dragster to the NHRA Super Comp world championship. Life was racing along right on track. But the next year he began experiencing health problems that were ultimately diagnosed as high-grade level 3B lymphoma, a cancer that had invaded his body from hip to neck. He underwent six months of chemotherapy treatments, but continued to teach at Hawley’s school and race as an amateur. Throughout the ordeal, Jack was inspired by an outpouring of support from family, friends and fellow racers. He had his last chemotherapy treatment on October 25, 2004, and remains in remission. 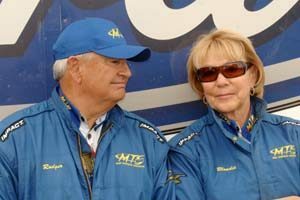 As he continued to regain strength, he drove 12 races in 2005 in a Top Fuel Dragster owned by Dexter Tuttle and partially sponsored by MTS. His journey to winning the 2012 NHRA Funny Car world champion began in 1986 when he made his first pass down a dragstrip in his El Camino in a time of 15.06 seconds and 90 mph when he was 19 and stationed at Clovis, N.M. When he was discharged four years later, he moved up to NHRA bracket racing. "First, it was all about the time slip. Then I realized you could win a trophy, and that's all that mattered. When I realized I could win money then my emphasis shifted to that.” Owning two NHRA world championships also is a nice payoff. And helping people is a longer lasting prize. Copyright© 2019. "Fast Jack" Beckman.